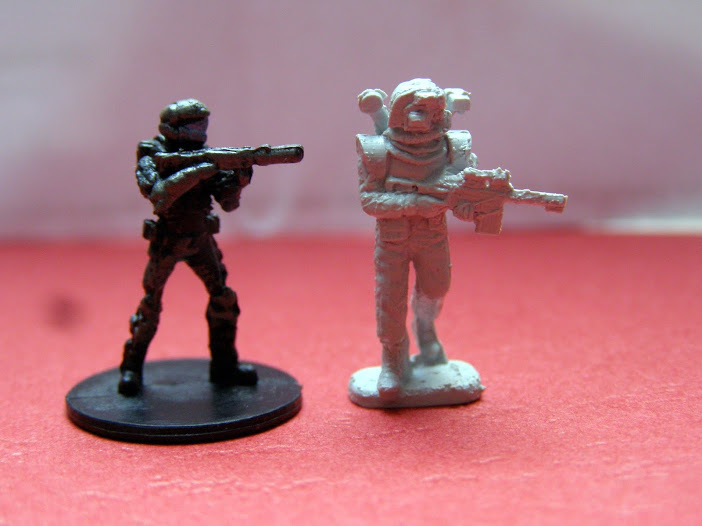 Sci-fi soldiers in 1:72 (or in wargaming more loosely perceived 20mm scale) are not the most popular subject. 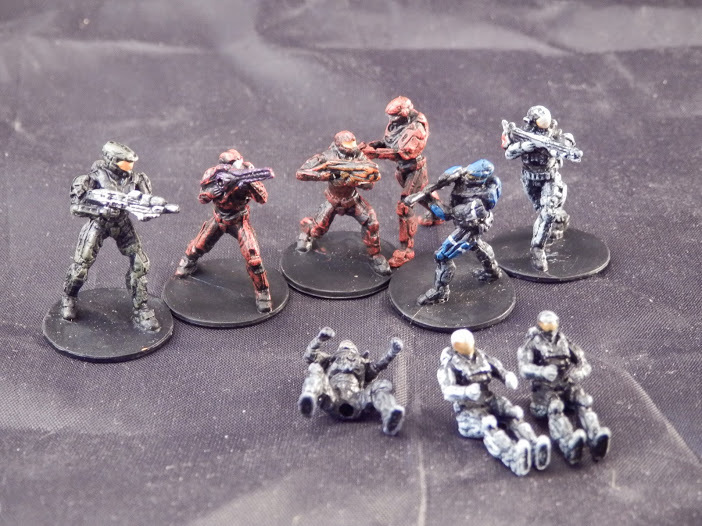 To date, the only generic set of sci-fi soldiers in 1:72 was Orion/Dark Dream Studio's set (described here). There might be several reasons for that - one of the most notable may be that wargaming is what now causes toy soldiers' hobby to bloom, and sci-fi wargaming is more used to 15mm scale (1:100 - 1:108) at the moment. 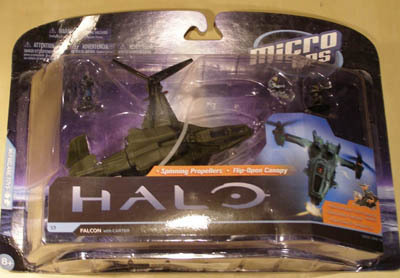 Was this the reason for cancelling a great-looking line of "HALO: Micro Ops" from McFarlane? McFarlane is a company known for producing figures in larger scales, often with full articulation and usually already painted. It was a surprise for the market when they released their first - and only - series of 1:72 figures, vehicles and structures. All of the depicted elements came from their blockbusting "HALO" series of computer games. The entire line was carefully crafted. In addition, the bases of the models were standardized and some moving elements were added. 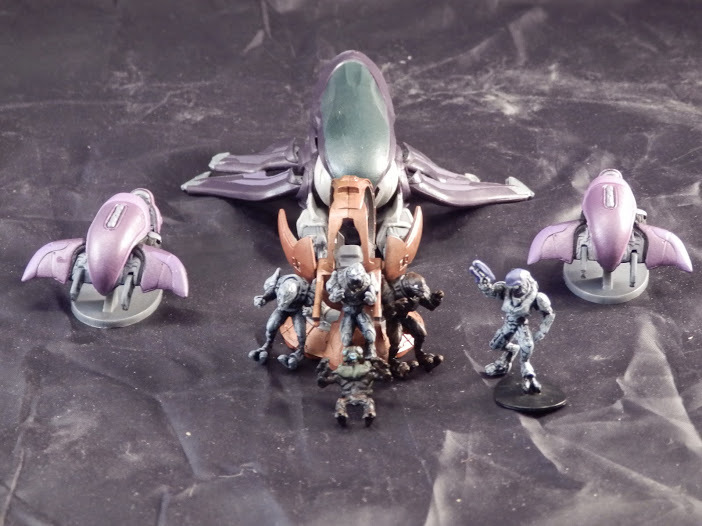 These features give the impression that HALO Micro Ops was not only meant as a collectors' but also a wargaming series as well. The entire "Halo: Micro Ops Series One" consists of 8 products: 4 small blisters, 2 large blisters and 2 large boxed sets. Each contains figures as well as scenery elements and/or vehicles in consistent 1:72 scale. All figures and models are assembled and painted. 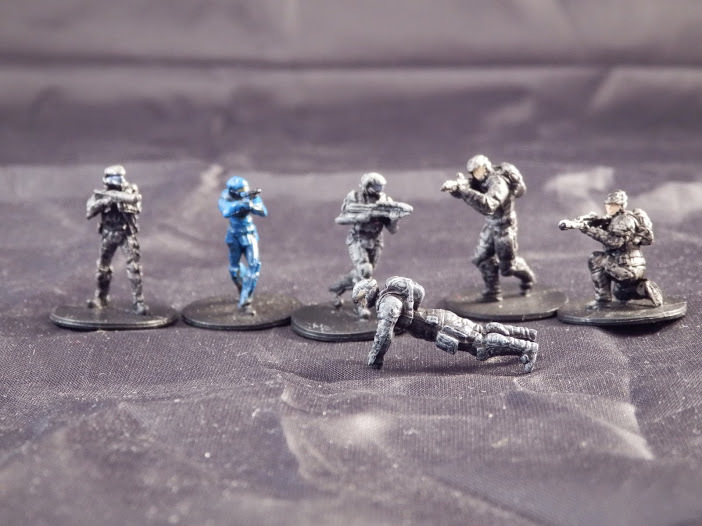 Pic.2 From right: UNSC troopers kneeling, moving and gunner (front), ODST Rookie moving, ONI officer in movement, ODST Veteran firing. Spartans - 9 figures (2 pilots/drivers, quad driver, gunner, 4 high-ready in movement and 1 low-ready). All of the poses seem perfectly natural and appropriate to depict intensive fighting (as imagined by a computer game, that is) of humans in the future. The UNSC troopers look very similar to modern US soldiers or some near-future concepts of their equipment. The ODST troopers are pretty similar to the UNSC troopers, with slightly more armor and full-face helmet. The female ONI operative is one of the better depicted fighting females in the hobby - the completely appropriate fighting pose is complimented by small feminine details like "walking the line" during movement that reveals hips or slightly more delicate posture in comparison to her colleagues from ODST. Nothing is out of proportion or exaggerated as is sometimes the case in other sets with female figures. All above figures are in correct 1:72 scale, although one has to assume that their body armors and clothing are relatively tight. Spartans have to be discussed separately and the main reason is scale. As generic sci-fi soldiers, Spartans from McFarlane's line of "HALO: Micro Ops" are not exactly in scale with the rest of the humans. This is because according to fiction, Spartans were humans with increased height, muscle mass and were also cybernetically connected to their body armor that covered the entire body and allowed to withstand space conditions. If regarded as Spartans, most of these figures are completely OK, although one has to pay attention to the heads - some of them are slightly too small considering the helmet they wear. 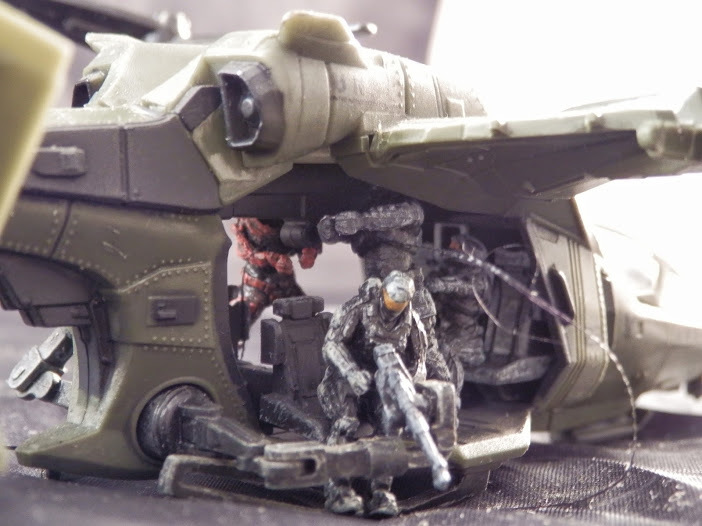 It is also slightly bizarre that Spartans are acting as drivers and pilots of supplied models, end result being far too many "special forces" figures in comparison to "regular" human figures. This may or may not be an issue to a collector, wargamer or modeler but there is a slight scale difference that may be felt. Spartans come as males and females although it is very hard to say who is who (which is good and seems realistic) - originally the female chest armor was slightly different than male's and that was the only difference. Using this as the indicator, Spartan quad driver and Spartan with alien gun seem to be female ones. There are 3 characters recognizable from the game - two from "HALO: Reach" and the main protagonist of the entire series, Spartan John-117 popularly referred to as "Master Chief". Weapons are very attractive and easily recognizable designs from the game - an assault rifle, a pistol, a designated marksman's rifle, silenced SMG and a shotgun are complimented by two types of alien guns (shorter and longer). They are true to their fictive origins but look very attractive as generic design as well. Pic.4. Aliens and their tools of trade; larger aliens have ball joint in the abdomen level. There are also 4 alien figures to be found in the line. Two of them are pilots and one is a ground trooper/warrior (all from the same species - "Elites") and there is also a turret operator from another species ("Grunts"). The figures are true to their fictive origins and the Elites have a ball joint on the abdomen level, which allows them to be placed in multiple positions. The only major drawback of all figures is that they are painted, or to be precise - the way they are painted. The base colors are put on very hastily and unevenly, and then the whole figure is just drybrushed with light grey. "Dry" is not the best descriptor of the brush used in most cases as the light grey stripes can be clearly visible in both figures and some elements of vehicles. The colors are hard to remove. Painting is not the strongest point of these figures. Pic.5. 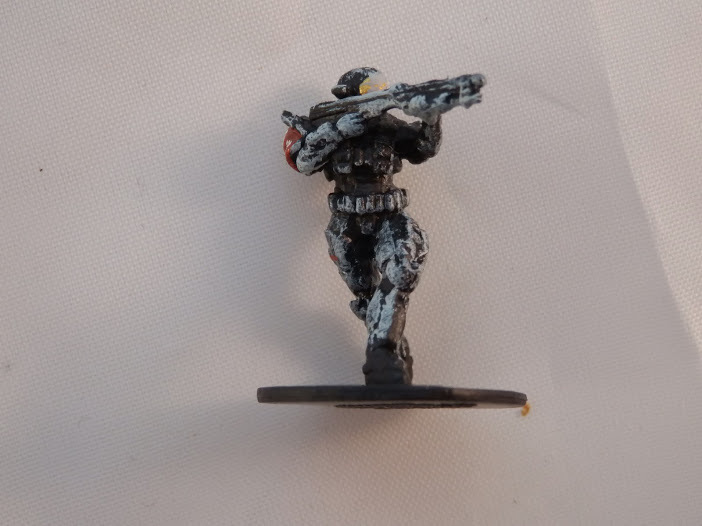 Close-up on painted Spartan figure. These are all well made and painted (including some weathering, generally much better than the figures), and they are also all pretty sturdy. They can be immediately put on the wargaming table for long and intensive use. For modelers, some superdetailing might be in order. Bunker, gate and tower are true to their counterparts in one of the most popular maps for multiplayer version of the game. Bunker is a separate element, but gates and walls can be put together in larger amounts in many combinations. Sadly McFarlane decided not to continue with the second series (which was already planned). One can only speculate on the reason but as with most market decisions it was probably based on sales' amounts. It happened despite the fact that wargamers from both 15mm and 20mm scale welcomed these new sets and the "Falcon" helicopter has apparently been the most popular product, now hard to get - probably because its design was both attractive and particularly well suited for 15mm scale. What does the whole series have to offer? A group of very attractive sci-fi soldiers in attractive and dynamic positions. 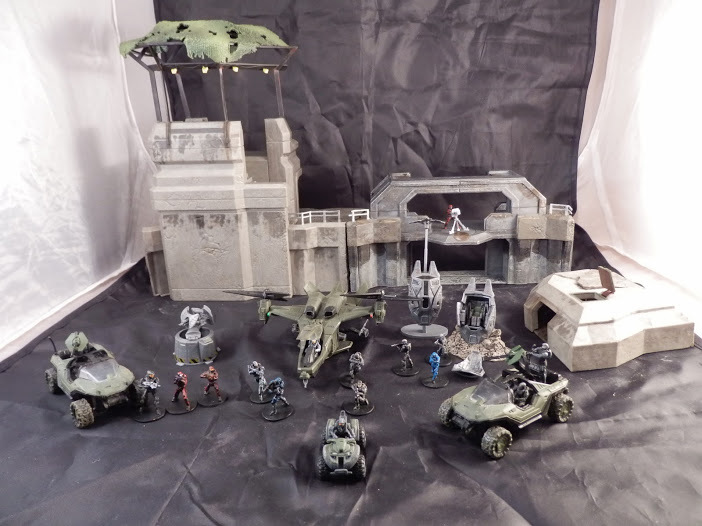 A large set of beautiful models and scenery to be used to sci-fi dioramas. A good amount of scenery for wargamers. All things considered McFarlane made a decent start in 1:72 scale. It is a pity they did not continue with it. It can be only assumed that the "1:100" signature was put as part of a marketing effort to convince the 15mm wargaming community to the product.